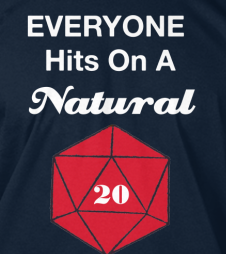 You can get it in on it at http://www.teespring.com/criticalhit. The campaign runs through the next three weeks. Doing okay. Still feeling a bit of the doldrums. Today I plan on posting a chapter of Tales of MU, as part of transitioning towards a Wednesday posting schedule. It’s a bit early to say if it’ll work out. I have some good material, not a lot of momentum.